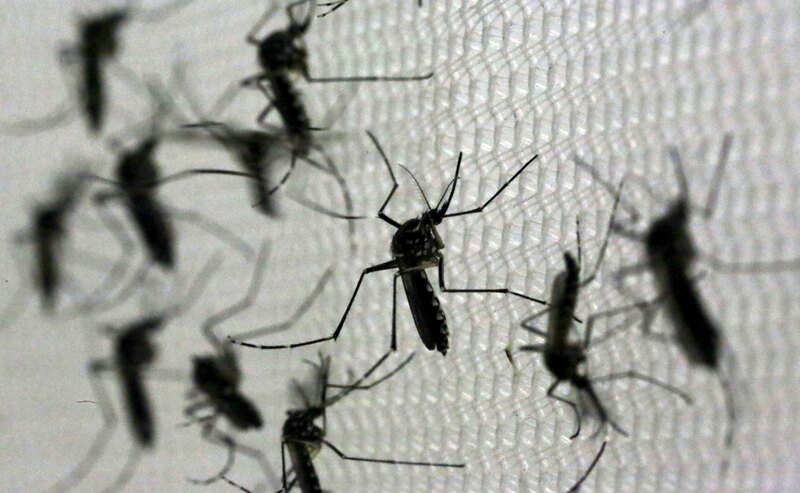 A report making the rounds online claims that a larvicide called pyriproxyfen -- not the Zika virus -- is behind the recent surge in the cases of microcephaly in Brazil. The claim has fueled conspiracy theories and allegations of a cover-up around the Internet, and even prompted officials in Brazil's southern state of Rio Grande do Sul to suspend the use of the insecticide over the weekend to allay concerns. But Brazil's Ministry of Health and independent experts say there is no scientific basis linking the chemical to the birth defect in babies. The claim originated with a group based in Argentina called Physicians in the Crop-Sprayed Villages. It released a report last week which states: "In the area where most sick persons live, a chemical larvicide producing malformations in mosquitoes has been applied for 18 months, and that this poison (pyroproxifen)[sic] is applied by the State on drinking water used by the affected population." Brazilian officials were quick to respond, emphasizing that there is no scientific evidence backing the claims. "Unlike the relationship between the Zika virus and microcephaly, which has had its confirmation attested in tests that indicated the presence of the virus in samples of blood, tissue and amniotic fluid, the association between the use of pyriproxyfen and microcephaly has no scientific basis," Brazil's Ministry of Health said in a statement. Officials also pointed out that some areas that do not use pyriproxyfen have also reported cases of microcephaly. The Health Ministry said it only uses larvicides that are approved by the World Health Organization. In a statement, pyriproxyfen's manufacturer, Japanese company Sumitomo Chemical, rejected any link between the chemical and microcephaly. It said the product has gone through "extensive toxicological testing, has shown no effects on the reproductive system or nervous system in mammals, and has been approved and registered for use in the past 20 years by the authorities of around 40 countries around the world." Throughout that time, "no correlation with microcephaly has been reported," the statement reads. Dr. Ian Musgrave, a pharmacologist/toxicologist and Senior Lecturer in the Faculty of Medicine at the School of Medicine Sciences at the University of Adelaide in Australia, called the Argentine group's claim "not plausible." "Pyriproxyfen acts by interfering with the hormonal control growth cycle of insects from hatching, to larvae, to pupa. This hormone control system does not exist in organisms with backbones, such as humans, and pyriproxyfen has very low toxicity in mammals as a result," he said. In addition, in order to reach the threshold levels for toxicity seen in animals, "an adult human would need to eat a teaspoon full of the raw pesticide," Musgrave said. "In terms of how much is present in water reservoirs that have been sprayed with pyriproxyfen to control mosquito larvae, a person would have to drink well over 1,000 litres of water a day, every day, to achieve the threshold toxicity levels seen in animals." The Argentine group called Sumitomo "associated to or subsidiary of Monsanto in Latin America," but Monsanto said that is not the case. In a statement, Monsanto said that while the companies have done business together in other areas, "Neither Monsanto nor our products have any connection to the Zika virus or microcephaly. Monsanto does not manufacture or sell Pyriproxyfen. The product is a larvicide, and Monsanto does not manufacture or sell larvicides. Monsanto does not own Sumitomo Chemical Company." The company added, "We support all efforts to combat this health crisis. We hope all efforts will be taken based on the facts, not rumors." Dr. Francis Collins, director of the U.S. National Institutes of Health, told the Wall Street Journal that the Physicians in the Crop-Sprayed Villages' assertions are "sketchy." "Let me advise caution in offering credence for this larvicide theory...unless and until there is more data to support it," he said. "The situation in Brazil and elsewhere will not be assisted by attaching unwarranted credibility to this interesting but speculative theory." Prior to the past year, Brazil reported about 150 cases of microcephaly annually. But since October, coinciding with the rise of Zika, the country has reported 5,079 suspected cases. On Wednesday, the Ministry of Health released updated numbers reporting 4,443 suspected and confirmed cases of microcephaly. Of that total, 508 cases have been confirmed, while 3,935 are still being investigated, according to officials. Last week, the ministry said 41 of the confirmed microcephaly cases were linked to Zika. Several case studies, including one published in the New England Journal of Medicine last week, detected Zika virus in samples of blood and fetal tissue, including the brains of babies in Brazil who died of microcephaly, providing what health officials call strong evidence of a link. However, they acknowledge that more research needs to be done to prove cause and effect and better understand the role the virus plays. Dr. Anthony S. Fauci, director of the NIH's National Institute of Allergy and Infectious Diseases, told the Journal that while no theory should be rejected at this point, the discovery of Zika in the brains of miscarried fetuses and babies who died soon after birth "strongly suggests direct involvement of the virus."